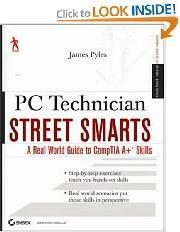 The Street Smarts series is designed to help current or aspiring IT rofessionals put their certification to work for them. Full of practical, real world scenarios, each book features actual tasks from the field and then offers step-by-step exercises that teach the skills necessary to complete those tasks. And because the exercises are based upon exam objectives from leading technology certifications, each Street Smarts book can be used as a lab manual for certification prep. Reader Michael D. Aldridge of Spring Hill, TN, says,"If you need some hands-on practice for the A+ exams, you really ought to invest a little in your career and buy this book. After all, most of us learn by doing... and in my opinion, there are no better hands-on practice scenarios than the labs included in this book. The step-by-step directions for each lab are clear, and Pyles' writing style is interesting and easy to understand. The book is also filled with helpful notes, tips, and warnings, many of which are critical for you to know for the A+ exams. In short, I highly recommend this book to anyone studying for the A+ certification. Not only will it help you pass the exams, but more importantly, it will also make you a much better tech."